The concept of a “proto-Tibetan Plateau” suggests that the central part of Tibet was flat 35-40 million years ago. However, it has been challenged by the latest discovery of palm fossils in central Tibet. In a study published in the latest issue of Science Advances on March 7, researchers from the Xishuangbanna Tropical Botanical Garden (XTBG) reported the discovery of the youngest well-preserved fossil palm leaves from Tibet. They showed that a large valley system with a floor less than 2.3 km above mean sea level (a.m.s.l.) existed in central Tibet as late as 25 million years ago. The researchers discovered the 25 million-year- old well-preserved fossil palm leaves in paleo-lake sediments within the Lunpola Basin in the central Tibetan Plateau. The fossil palms are characterized by their prominent spine-like structures at the base of the leaf blades, which are different from any other previously reported palm fossils. After consulting the literature and herbaria, the researchers placed the fossil palm in the organ genus Sabalites and named it Sabalites tibetensis. “Our discovery of 25 million-year-old palms showed that central Tibet must have been no higher than 2.3 km and hosted large lakes fringed with subtropical vegetation”, said Prof. SU Tao, the first author of the study. The researchers from China and the UK determined paleotemperatures at sea-level using coeval proxy data and combined with climate model-generated local terrestrial thermal paleolapse rates for a range of topographic scenarios. They further estimated paleoelevations using the mean temperature of the coldest month and explored the unique cold sensitivity of palms combined with climate model simulations of ancient winter temperatures across a range of possible ancient landscapes. They found that only a deep central valley with a floor at about 2.3 km fringed north and south by high mountains provided the right conditions to allow palms to grow, particularly during the most cold-sensitive seedling stage of their life cycle. “It now seems that as recently as 25 million years ago, the Tibetan landscape consisted of high mountains and deep valleys”, said Prof. SU. “Moreover, the Tibetan landscape must have only become a plateau much more recently after compression from India and sediment infilling raised the valley floor by at least 2.5 km to its present height of 4655 meters”, said Prof. ZHOU Zhekun, correspondence author of the author. “We infer that the topography of the late Paleogene was far more complex than often envisaged,” said Prof. ZHOU. 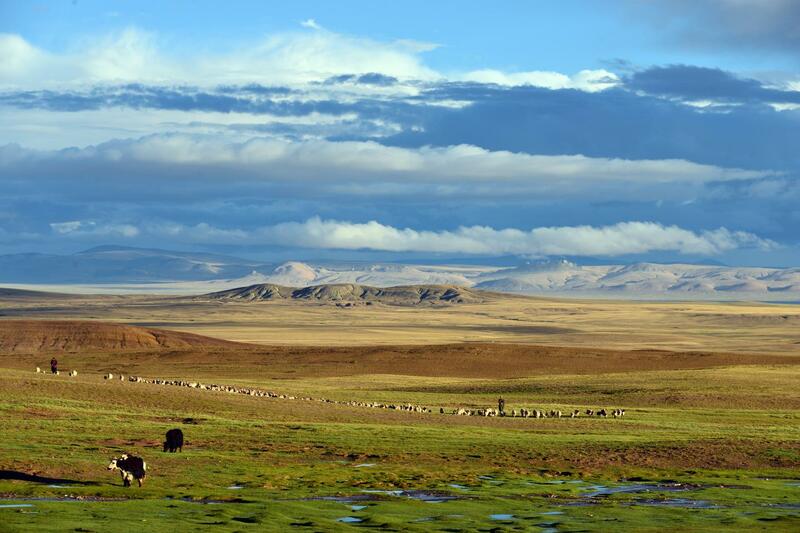 The study was jointly supported by the Strategic Priority Research Program of CAS, the Second Tibetan Plateau Scientific Expedition (STEP ) program and the China-UK joint project Understanding Monsoons and Biodiversity Relevant to Landscapes and Livelihoods in Asia (UMBRELLA).